Seeing is Believing This sample manual to teach Upgrading to Office 2007 is in MS Word format. 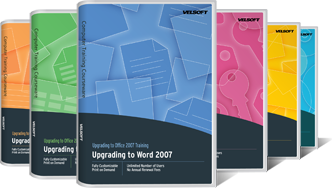 For those who have a knowledge of Office 2003, this is everything an instructor needs to teach the most essential program upgrades. With the Upgrading to MS Office 2007 bundle of courses, you get everything you need to begin training right away. Each course comes with Student and Instructor Manuals, Pre-assignments, PowerPoint presentations and more!